Wow! Your work is fantastic! Like this???? I love this…It looks so real. Thank you for sharing your wonderful work. I am so glad I found you!!! Wow, the realism is so incredible. The amount of detail leaves my head spinning. Thank you very much – I love drawing in a lot of detail! Wow, to be perfectly honest for the first 5 seconds or so I actually thought it’s a picture of a cat…How long does it generally take you to take care of all these details? Amazing work! Thank you so much for your message 😊. 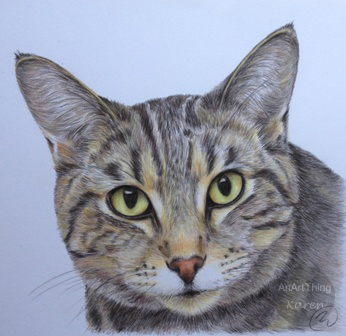 My coloured pencil drawings generally take between 20-30 hours. I love drawing and painting detail, and trying to make my work look ‘real’. Well I can certainly see that, I would not have the patience to spend so many hours on every line, simply because it’s not one of my passions. But oh, how many hours I am able to spend on one single sentence, to make it perfect for what I want with it! Time and effort is greatly diminished when passion sparks our actions… So congrats for your lovely drawings, looking forward to see some more! Oh thanks … I hope to post some more soon.